Parents prtoested in front of the zonal educational office in Chavakachcheri from morning to noon on Friday urging the authorities to reopen the Pokatti Roman Catholic Tamil Mixed School (RCTMS) as promised. 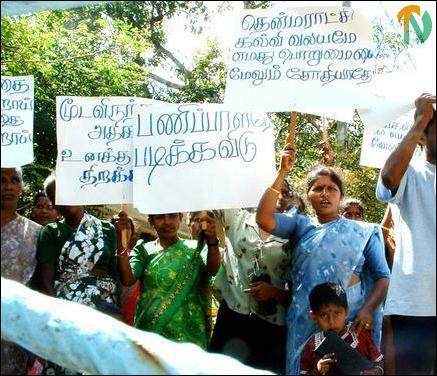 Another group of parents launched a protest at the Eluthumadduval Women’s Rural Development Society Friday afternoon demanding that the Eluthumadduval Government Tamil Mixed School (GTMS) should be reopened soon. The Eluthumadduval GTMS is located in an area still garrisoned by the Sri Lanka army. Parents say their children have to go all the way to Mirusuvil to attend school now. The Pokatti RCTMS was closed in 2000 when people fled the village of Thavasikulam during intense fighting between the Sri Lankan army and the infantry formations of the Liberation Tigers that were advancing on Jaffna. Thavasikulam is a village in the general area of Mirusuvil in Chavakachcheri. Parents say that their children now study at a school in Kodikamam now. “Our children have to walk more than three kilometers to school now. The Zonal Education office promised to open the school yesterday. But nothing was done”, a protesting parent said. The protestors dispersed after the Zonal Education officer Mr. V. Selvarajah promised to take necessary action to reopen the school as soon as possible.